This authoritative text of Bleak House was the first to be established by a comparative study of all the surviving versions of Dickens’ novel, incorporating evidence from the original manuscript and corrected proofs.Study of the genesis of the novel is facilitated by the reproduction of Dickens’ working plans and, for the first time, by some thousands of meticulous textual notes. 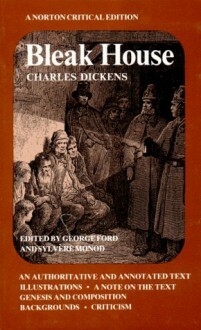 "Backgrounds" offers all of Dickens’ correspondence about Bleak House as well as contextual materials that document the Victorian controversy over pollution, a theme central to the novel, and present contemporary attitudes toward the government, the courts, and the police, to enhance the setting of the story. Also featured are several hundred annotations which fully elucidate for today’s readers the allusions and topical references in this remarkably allusive Victorian masterpiece. Especially helpful is a clear exposition of the nature of law procedures in the Court of Chancery, which is crucial to an understanding of the central action of the story. "Critical essays" reprinted here include interpretations by G. K. Chesterton, J. Hillis Miller, George Ford, A. O. J. Cockshut, W. J. Harvey, H. M. Daleski, and Ian Ousby.